Will Golden Knights’ Lucky Streak Continue? Raise your hand if you predicted Vegas Golden Knights would begin the season 3-0-0? Although many fans expected this new branch of desert hockey to fail, the Knights are shocking us all. However, although things are rosy in Nevada right now, just how much gas in the tank? Ahead of tonight’s showdown with Detroit at T-Mobile Arena- will this be the game to break the streak? 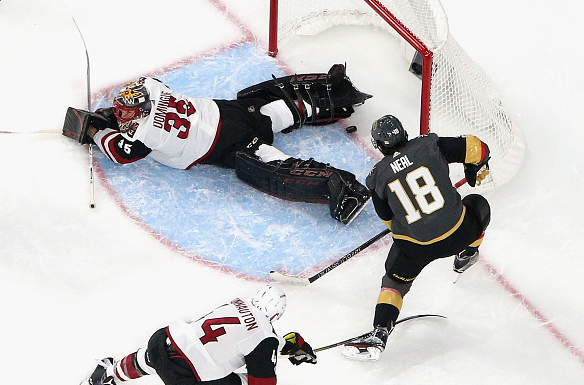 Winning their first game 2-1 against Dallas, Vegas showed they aren’t just a mere attraction. Fans everywhere suddenly clued in that this could be a real contender. As a result, this team is riding the wave of success and doesn’t want to fall off anytime soon. So far they have seen off Dallas and Arizona both home and away. Having limited time to put a squad together hasn’t phased them in the least. James Neal has been on fire so this season and is Vegas’ de-facto leader. Scorer of their first ever franchise goal, Neal is showing Nashville why letting him go was a big mistake. Nate Schmidt has also been a dominant force on the blue line with 3 points. Marc-Andre Fleury has been the glue holding things together. After an unhappy final season in Pittsburgh- the 32-year-old Quebec native is clearly relishing being number one. With a microscopic 1.32 GAA and .963 save percentage, ‘Flower’ was the smartest choice Vegas made. While they have been coming up Aces, Vegas is also yet to have a serious challenge. Winning dual games against Arizona might be impressive, but what will the result be against true contenders? Chicago, Toronto, Washington and St Louis have been in dynamite form this season. Vegas has spirit, there is no denying that, but do they have a good enough squad to see off snipers like Patrick Kane? Or the resources to shut down Auston Matthews? Right now, that’s not the case. So far, the Golden Knights have played solid teams, but not outright threats. Tonight’s game against the Red Wings could possibly provide an upset. Although Detroit’s off-season was less than productive, they’ve still played well early on. Vegas right now will feel invincible and this a dangerous thing in hockey. One thing we know for sure about the Red Wings is that they love an upset. One thing we know for sure about the Golden Knights is that their Twitter game is on point. Don’t get me wrong, this team definitely will have a successful future in the league. Many didn’t want to believe that Bettman’s Vegas experience would achieve anything. This team definitely has the potential to push for the playoffs, but you just get the sense this is the honeymoon period. How Vegas reacts when their inevitable first loss comes calling will be a reflection of where they are at. Currently, they have deserved their early success but it’s premature to call them contenders. Tonight’s big test will be an interesting one.